Babies have to eat just like the rest of us, vacation or not! And dining with a baby at Disney doesn’t have to be complicated, it just takes a bit of advanced planning. 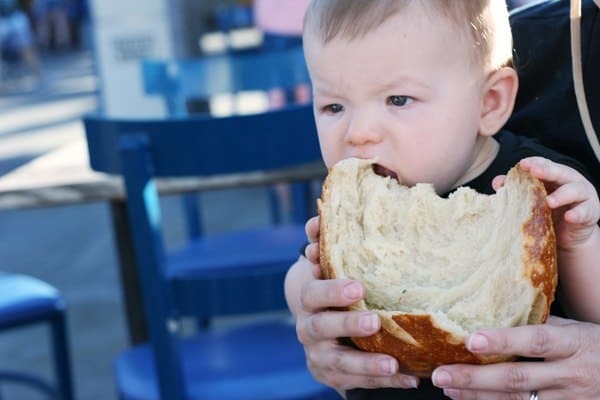 Here are all the tips on which restaurants are best for babies, what dishes are appropriate for sharing, highchairs, what you need to bring and where you can feed them. You can pack your own baby food and snacks to bring with you into the parks. Plastic baby food tubs or pouches are ideal since they are lightweight. Normally glass containers are not allowed into the parks, with the exception of glass baby food jars. But for the sake of break-ability, you might want to just go with baby food in plastic instead. Foods can be packed into a soft sided cooler (no hard side coolers allowed). Consider taking a sip out of a water bottle and then freezing it. Use the bottles in the cooler to keep foods chilled. Consider repackaging baby snacks (like crackers or yogurt melts) into smaller zip-close bags as they will take up less space than the original containers. If baby can’t use a full sized spoon yet, pack your own baby spoons and wash them in the bathroom sink, like the Munchkin Infant Spoon Set . 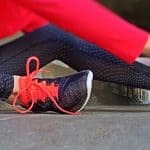 I’ve included a few more details on other items you might be considering bringing with you, from the highchair cover, place mats, bibs and wipes. 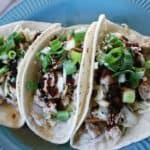 Keep reading for my meal recommendations for little ones too! On a recent Walt Disney World visit, I considered bringing a highchair cover for my 6-month old daughter but the cover is so bulky and I had such a small amount of space to store it in the stroller basket. 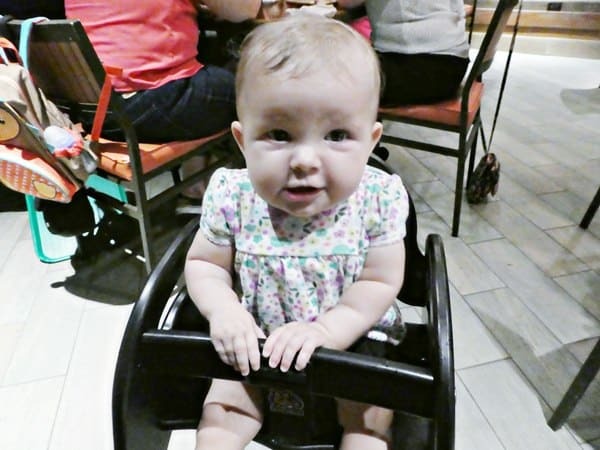 I decided to leave the cover behind and just place my daughter directly in the highchair. First I made sure that the buckle was working properly on the highchair. Then I took a baby wipe and cleaned off all surfaces that she could reach. One less thing I had to tote around! This is one baby item I recommend leaving at home. Nobody wants to tote yucky food-covered bibs all day through the parks which is why these disposable paper bibs are wonderful. 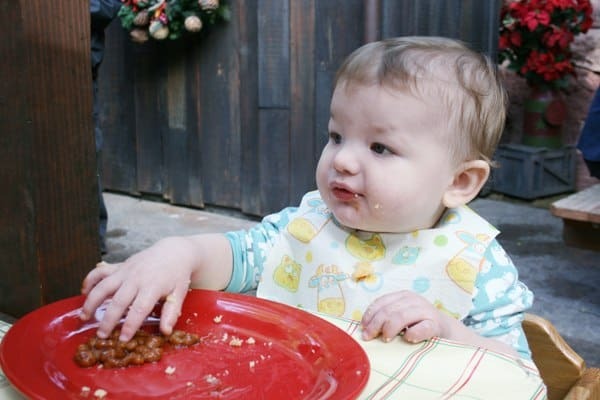 As you can see, they came in handy when our little boy was eating baked beans at the (now gone) Big Thunder Ranch BBQ. What do you mean the beans are all gone? Long days at Disney can dehydrate anyone so make sure your baby has a cup with water. You can request ice water from any quick service dining location and pour it into their cup. My little one is just learning how to use a sipper cup with handles like these. 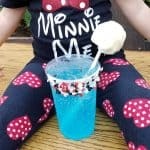 If sippy cups tend to disappear, consider bringing these inexpensive “take and toss” cups that won’t bother you too much if they are lost. A “dropper stopper” leash that you attach to baby’s cup will keep it from being tossed on the floor or thrown out of the stroller. Baby wipes are so versatile and I always have a bunch of them to use throughout the day for cleaning off surfaces that my baby will touch. 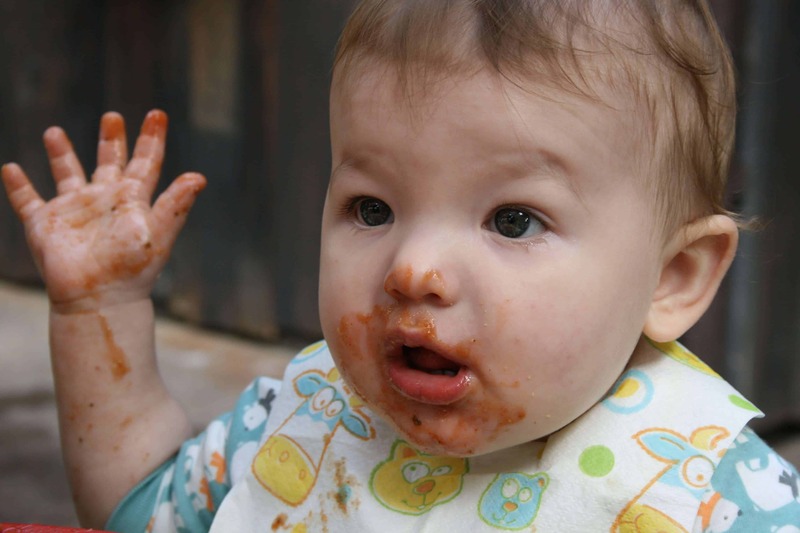 They also make quick work of food messes so you can wipe off baby’s hands and face after meal time. Buy a big refill box and a portable case. Reload the case each morning with fresh wipes and store it in the diaper bag. I actually used up all my wipes with a few hours left to go in the park. Fortunately they had a refill packet for sale of Huggies wipes in the Baby Care Center so I could get through the rest of the day! Naturally, any restaurant inside the Disney parks will be appropriate and welcoming for your baby. You can also feed your baby inside any of the Baby Care Centers. 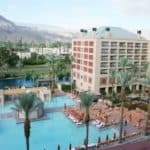 There are highchairs, microwaves for heating food, sinks for cleaning up and even supplies (like extra food and snacks) available for purchase. Step inside the air conditioned Baby Care Centers for baby dining areas including high chairs. 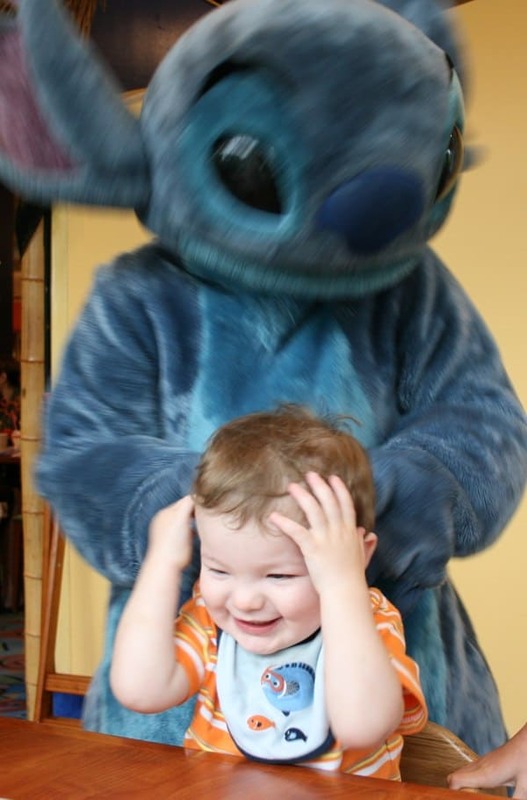 If your baby loves the characters, consider one of the Character Dining Experiences. Baby will be able to meet n’ greet with their favorites as they eat. The characters will come directly to their highchair and you’ll be able to snap pictures and request autographs. No need to place a separate order for baby if he is able to eat table food. If you are ordering a plate of food in a full-service or quick-service restaurant, you can share with babies (2 and under) from your plate for free. If you’re dining at a buffet, you may fill a plate of food for baby without any charge. 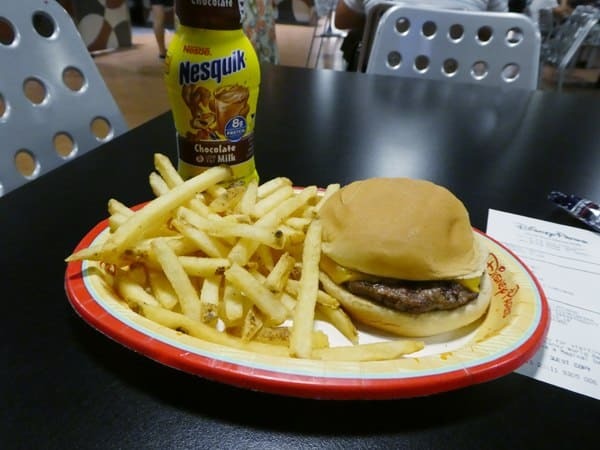 Good meals to share with baby includes the rotisserie chicken with mashed potatoes at Flo’s V8 Cafe, Garden Vegetable Burger at Village Haus and Penne Pasta from Plaza Inn. 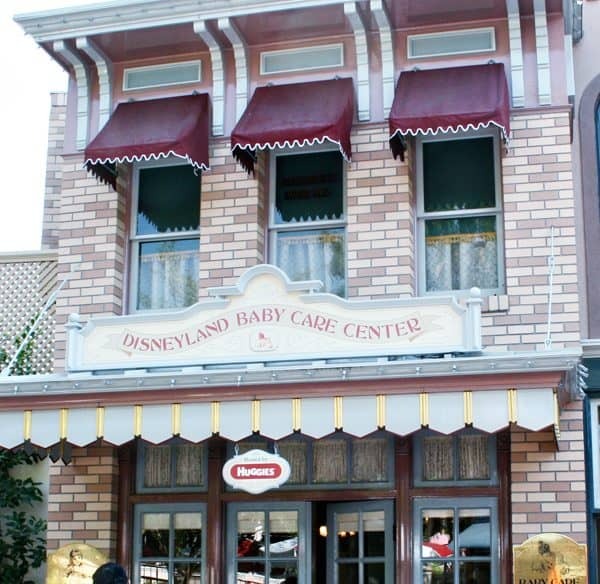 You can certainly bring in your own baby food but if you need additional pureed baby food or snacks, you can also purchase them at the Baby Care Centers inside each of the parks. A classic: Fries and hamburger! 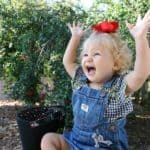 If your older baby can eat their own meal, many locations offer a Toddler Meal that’s a smaller size with flavors that little ones may enjoy. Cheesy macaroni seems to be the main dish offered at most of the locations but you can also get rice and beans at Rancho del Zocalo or Arroz con Pollo at Cocina Cucamonga. These meals also come with applesauce and lo-fat milk. Avoid anything that will get easily broken or melted in your diaper bag all day. Dry Cheerio-type cereal is always a hit. My little boy loved the yogurt melts and I can’t wait until his little sister can enjoy them too. And since it’s a vacation and baby might want to have a treat too, bring some cookies for baby to enjoy as well! 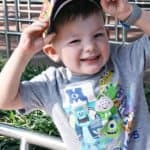 What’s your favorite dining with a baby at Disney tip? Share with me in the comments! 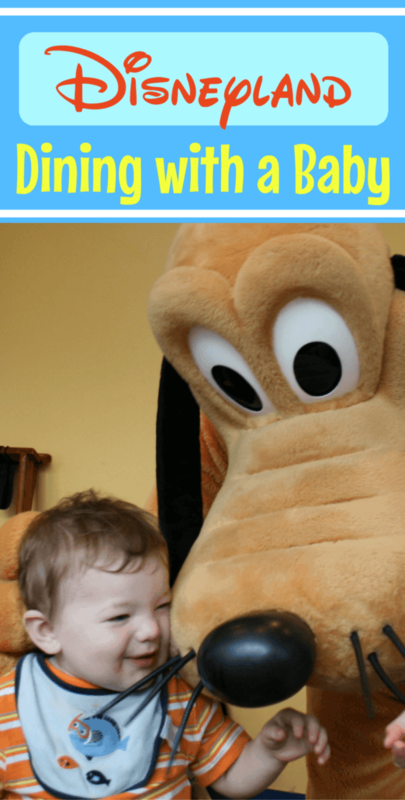 « Disney on Ice at San Diego’s Valley View Casino Center – GIVEAWAY! 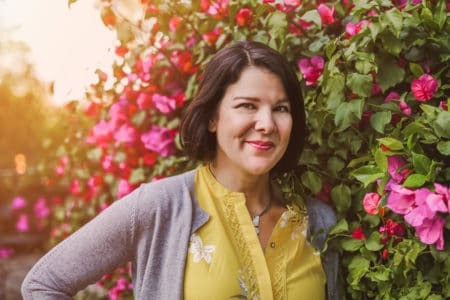 These are some great tips, Julie!!!! 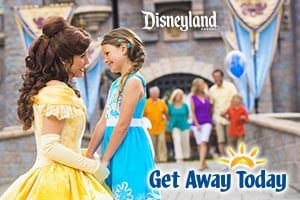 I’ve already pinned this and plan to share with some of my friends planning a Disney vacation with littles.